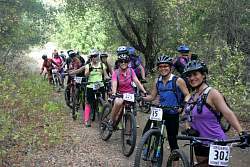 This year’s Girlz Gone Riding Rocktober festival & CORBA Membership Drive was by far the largest to date! With 37 exhibitors and over 300 in attendance, our expectations were far exceeded! 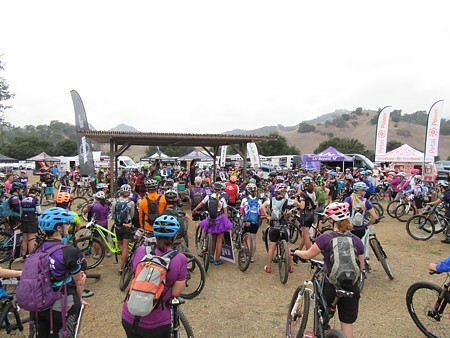 After signing in, the girlz grabbed their goodie bags and one of about 100 demo bikes if they had reserved one, then gathered around for the commencement address. I introduced each chapter and the chapter leaders. I talked about the two C'S which I live by. Community and Club. All supporters and exhibitors at the event received a verbal mention and we went on to intro our 4 amazing volunteer coaches this year. Returning head coach Leigh Donovan, returning coach Christine Hirst, new coaches Kris Gross and Erica Phillips. This year's community award, given to the shop that shows the greatest support for women's cycling, went to G2 Bikes and Girls Ride 2! G2 and Girls Ride 2 earned this award hands down. Steve Messer, our CORBA President, spoke about trail etiquette. Every Rocktober event is also a CORBA membership drive. 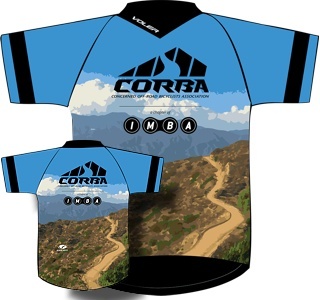 Each GGR chapter partners up with their local IMBA chapter. Next was the huge group photo session (see panoramic photos above and below), then riders split up into their guided ride groups and skills clinics. We had guided rides for all levels and beginner skills clinics running all morning. Rides were all through the park including the famous MASH site, Grasslands and Little Bulldog trails. When riders came back after their guided rides, they enjoyed an afternoon of tons of exhibitors, more demo bikes, lunch, catching up and just enjoying the day. We ended the day with over $20K of raffle prizes including grand prizes from REI, Specialized, Sacred Rides and San Juan Huts. We thank all the bike companies that came out to Rocktober. 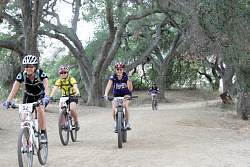 With all the equestrians and mountain bikers now sharing many of the multi use trails, we thought it was well overdue to get a program going so all are able to share the trails safely and even ride together. In order to accomplish this, there must be protocal and trail etiquette set for both equestrians and mountain bikers. On Sunday, October 11th, we decided to give the program a try with the help of a few of the local equestrians at The Davis Ranch in Chatsworth. We wanted to keep the 1st time very small and more of a pilot program since this was the 1st time I had put this plan into action. We started out in the riding ring which was enclosed, then took it outside of the ring. To see the rest of Wendy's story, and photos, check our our blog on bikes and horses. Saturday and Sunday, November 7 & 8, 2015: Ken Burton Trail. We have been waiting for some time to begin work on the Ken Burton trail. 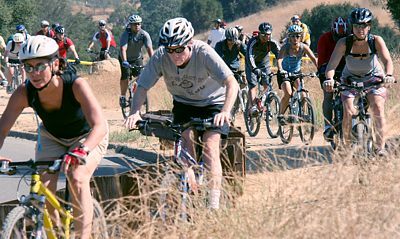 This much-loved trail was built by the Mount Wilson Bicycling Association in the early 90s, creating a loopable route with Brown Mountain and the Gabrielino Trail. CORBA and MWBA will work on Ken Burton and to connect it to the restored section of the Gabrielino. Once completed, we’ll ask the Forest Service to open the Brown, Ken Burton, Gabrilieno loop route to the public. Logistics require us to haul in tools and equipment by Bob Trailer. Most of the two days of work will entail cutting back brush. Surprisingly, much of the tread is in good condition, and most of the switchbacks appear to be generally intact. Please see full details and RSVP for the trailwork on our meetup group at http://meetup.com/corbamtb or on the MWBA Facebook page. Summary of the October 17th COSCA Annual Trailwork Day in Wildwood Park: 163 volunteers, including 16 from CORBA and members from at least two high school mountain bike teams, built 3/4 miles of new trail, and an alternate access to the bottom of the Lizard Rock Trail. The new trail bypasses the steepest segment and has a better view because it faces more to the west, away from the Hill Canyon water treatment plant. Most of the new trail was across a steep slope so our job was to dig out the dirt to form a nearly level trail tread. There was lots of dirt (and in some places, just as many rocks) to dig out! My crew finished our section in about an hour and a half, so we moved down to the bottom of the trail to help there. Overall, we got the trail finished about a half hour sooner than planned for. Everybody headed back to the registration area for the barbecue that the COSCA rangers famously prepare for the volunteers every year. 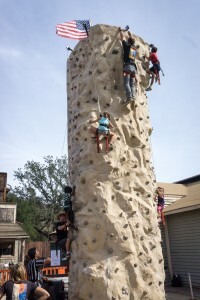 The lunch was followed by a give-away of trail-related items, the most significant being a new mountain bike donated by Giant Bicycles in Newbury Park. You can read the full summary on our blog article of the work day. You can see the photos in our photo gallery of the work day. Summary of the October 31st Backbone Trail Backbone Trail restoration: On our third outing to this very popular 2.5-mile long segment of the BBT, 16 CORBA volunteers and a half dozen from the Santa Monica Mountains Trails Council hiked 1.5 miles up to the work area, with the CORBA crew working up from the lower end, while the SMMTC crew continued to the upper end and worked back down. 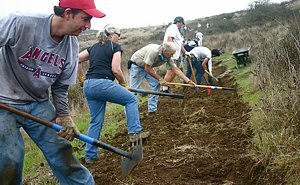 The CORBA crew focused on cutting back the brush, but the SMMTC crew also worked on the tread – cleaning and fixing the drains and spreading the slough across the trail to level it out. (Slough is the dirt that falls onto the inside edge of the trail from the hillside directly above, resulting in a narrowed usable trail because people don’t ride or hike on the uneven and loose slough.) Since the two groups were working towards each other, when we met in the middle in the early afternoon, the total length had been completed, at least in theory. It turns out that there was still a short section to go, but it was in pretty good shape to start with. You can see photos in our photo gallery of the work day. And of course, thanks to the tireless efforts of Mountain Bike Unit volunteers and Walk & Rollers’, more than 160 kids, and some of their anxious parents, were able to try mountain biking through CORBA’s Youth Adventures program. 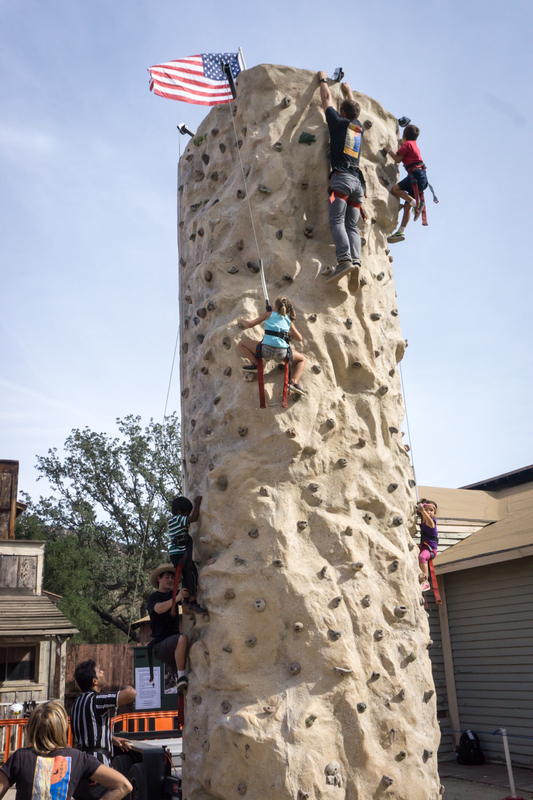 To read the rest of the story, visit our blog article on the 2015 Rec Fest.